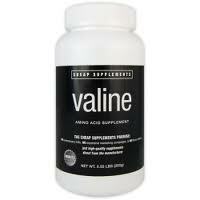 Valine is an essential amino acid which is considered important for body growth. It is needed for the proper performance of the nervous system; an adequate intake prevents nervous and digestive disorders. W. Borrman, a nutrition researcher, describes valine as helpful in disorders of the muscles, mental and emotional upsets', insomnia, and nervousness. Valine intake as a part of the amino-acid combination of phenylalanine-valine-methionine-tryptophan in the ratio of 3:2:2:1, taken in 4 g doses prior to meals, results in decreased food intake in 50 per cent of obese women. The main food sources of valine are leafy vegetables, finger millet, rice and other cereals, kidney beans and other legumes and pulses, piyal seeds, pistachio and cashew nuts, and peaches. Poultry and milk contain a large amount of valine. The lack of valine makes a person sensitive to touch and sound. Excess of valine leads to symptoms such as hallucinations and a sensation of insects crawling over the skin.